If you know me, you know that I am a firm believer in the benefits that kids reap when they play with toys. According to Child Care Resources, when children have time to play with toys, they manipulate, explore and experiment. They learn many concepts and develop important skills while having fun. When it comes to toys, I am always in the loop. I love getting my kids toys that will get them away from screens and more active. Even if they are just using their imagination, it’s a win. Believe me, I do love screens and I think they are amazing tools for kids to learn and grow too. But, nothing like making your own world with your toys, know what I mean? I used to love playing on my own or with my brother and sister. We would play for hours! They are super cute and so unique. 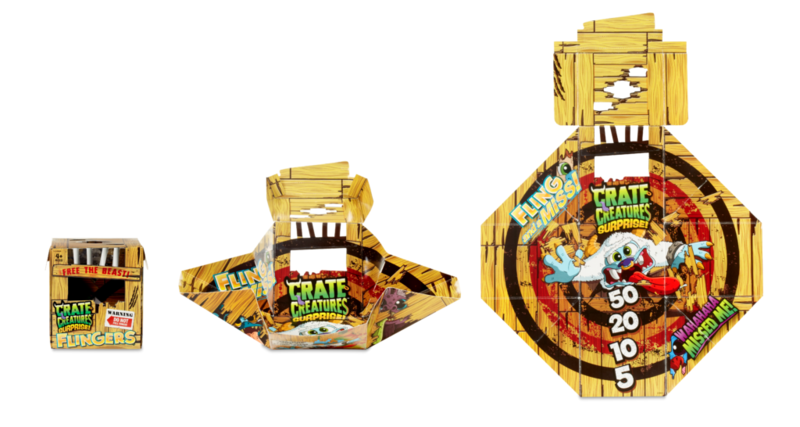 Break your Crate Creatures Flingers out of their boxes, pull their tongues and launch them for monstrously fun sounds and interactions. Each Flinger has unique sounds and noises, as well as a light up stomach when you interact with them. Fling them to your friends in a game of catch, use them to knock down targets, or fling them into one another for hilarious noises! I think it is so cool that you can even use the box itself as part of the gift. You can set up the box so that you can use it as a target. Talk about a gift that keeps on giving. After all, don’t most kids love the box as much as they love the toy? There’s nothing like getting kids playing! 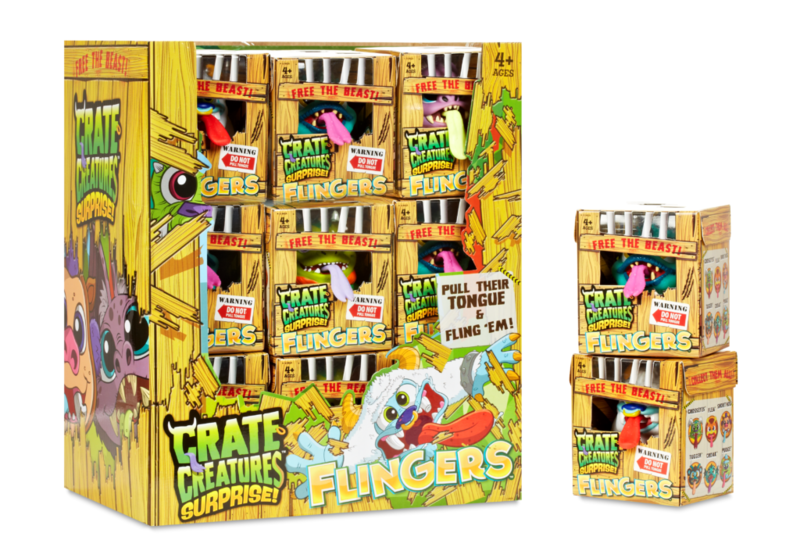 That’s why I’ve teamed up with the awesome folks from MGA Entertainment to giveaway Crate Creatures Flingers to one lucky Whispered Inspirations reader. This contest opens on November 25, 2018 and closes on December 10, 2018. If you think these toys are awesome, check out the rest of gift ideas for kids in my Holiday Gift Guide. Would your kids love to fling these around? My grandkids would love to win this package. My younger grandsons would love a Crate Creature! My grandsons would love this toy! My nephew would enjoy playing with this fun toy. My son would definitely LOVE this. My niece would love this….thanks for the chance! My niece would have a ball playing with this. The little ones I babysit would have lots of fun with these. My niece would love this, and playing for toys allows for a cultivation of creativity and joy! My little man would love to play with this toy! My granddaughter would be super excited,she has been asking for one since she seen one at Walmart! I think it is important for kids to play and use their imaginations! I think both my sons would love the Crate Creatures. They are super cute and fun. My little one would love playing this toy, looks fun! I would love to win this for my family. Our elf needs a friend and the more the merrier. My granddaughter would enjoy this very much. My granddaughter has this on her list ! My little man will be happy to play with this funny toy! My son and daughter would love this toy! my grand daughter or grandsons would love it! My grandson would love a Crate Creature! Most definitely my son! He would love these creatures! My little man will be happy to get this toy !!! my daughter would love these! she loves any blindbag type toy. Thanks!! This would be great for my daughter. My son Matthew would love this toy!!! My son would really love these Crate Creatures. He saw them at Walmart and was having fun just looking at them! My niece loves toys like this! We would have fun with the Crate Creature! i have some grandkids that would be so delighted with them! My niece would love to get these toys! I think its important for kids to play because it helps my son with independence and imagination. My grandsons would love a Crate Creature! This would make a great gift for my nephews or my daughter. I would love this toy for my nephew! I remember growing up Christmas used to be so chaotic, there were so many kids around! one of my grandkids would really love it! Both my daughters would enjoy playing with this. They would like to hear the sounds it makes. My daughter loves mGA toys and these crate creatures are adorable. One of my favourite holiday memories was my first Chritmas as a mom. My daughter was 9 months old so she was a lot of fun. She loved the tissue paper. My little one would love to get this toy this holiday season!